"FYI HINDI NIYO AKO KLIYENTE AT HINDING HINDI KO KAYO INIINDORSO. 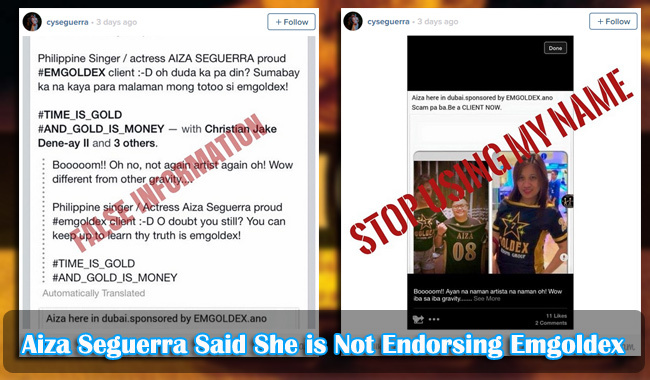 Nag-sponsor kayo ng show ko sa Dubai at binigyan niyo ako ng t-shirt at dahil maayos akong tao, nagpasalamat ako, at nagpa-picture ako sa inyo.” This is some of the Instagram posts of 31-year-old Aiza Seguerra. Emgoldex works by means of recruiting members wherein an investment of P1,000 will yield P5k to P10K, and P35K to P180K – P360K. Recruitment in the scheme should be two in order to earn, and earnings come from the money of the clients on which the Security and Exchange Commission considered this a pyramid scam. Emgoldex has no right to collect money from public due to the fact that it is not registered in the Philippines as corporation or partnership. The company is now threatened to face a P5M fine and a 21-year imprisonment. STOP USING MY NAME TO ENTICE PEOPLE TO JOIN YOUR GROUP. Ginamit niyo ang walang malisyang photo-op para sa kapakanan ninyo!!!! Mahiya kayo. STOP USING MY NAME! There were so many countries that banned Emgoldex already which include Finland, Colombia, Estonia, and Panama. Aside from this, there is already a cease and desist order imposed on Emgoldex in Massachusetts in USA. On the other hand, there is also a claim by members that it is registered in Europe. Because of this issue, there is a warning issued by SEC to the people.